Are your online reviews not reflecting how patients feel about your practice? Proactively manage your reputation to match actual patient satisfaction with your online reviews. Our experience and research has proven that, left untouched, online reviews tend to inaccurately portray a healthcare practice's operations. You know that your online reputation is crucial to your online success. That’s why we’ve built a proactive approach to healthcare reputation management that gives you control of your online reputation, patient care, and so much more. 93% of consumers heavily weigh online reviews. A proactive approach is the best way to an accurate and positive reputation for your practice/providers. Consistent outreach after every appointment allows you to keep track of satisfaction. AI-based sentiment analysis reports give deeper insights. Get notified of every negative experience and use a seamless process to address them. Our clients see service recovery rates of up to 80%. Create workflows that save time and highlight problem areas in your practice – including provider/location performance breakdowns and word clouds. Stay in touch with your patients on a consistent basis to improve retention. Send out SMS/email broadcasts and holiday/birthday eCards, and easily address concerns. RepuGen administers an automated survey process to understand your patients' sentiments immediately after a visit, then directs them to review sites to share their experience. As a result, you’ll better understand your patients, improve interaction, allow for service recovery, and strengthen your online reputation – all at once. What Does Your Medical Practice Need? Unhappy patients are always the most vocal. RepuGen protects your medical business from negative reviews through a simple yet robust patient recovery process. Through a proactive medical reputation management approach, we'll improve your online review scores by consistently acquiring genuine positive reviews. Ever wonder what your patients are thinking the moment they leave? You'll understand this and using AI will see trends over time, allowing you deep insight into the patient experience. Immediately reach out to unhappy patients to understand the situation, perform service recovery, and retain them as a patient. 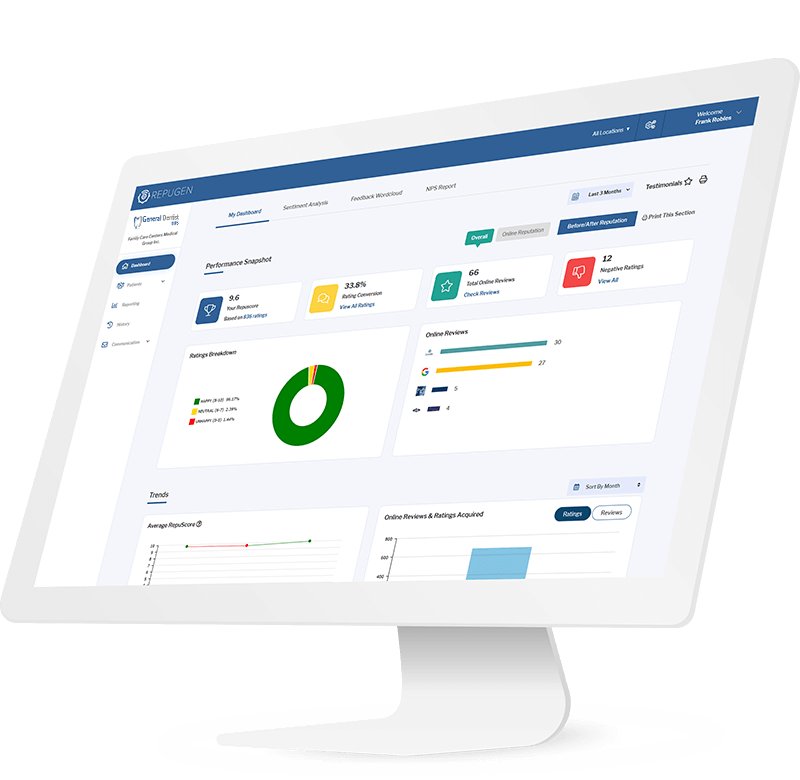 Grant varying degrees of access to fine-tune your management workflow, including the ability to monitor practice manager activity within the RepuGen platform. Stay even more connected with your patients through a suite of tools that include email blasts, eCards and referral program capabilities. Which Healthcare Industries We Have Worked With? Not in healthcare or don't see your industry listed? Contact us to learn what we can do for you. By integrating directly with your CRM, EMR and/or EHR system, RepuGen can become 100% automated and operate with little intervention. Don't see your platform listed? Contact us to see if we can build an integration. Note: RepuGen does not require EMR/EHR integeration. "Excellent service to boost online positive reviews by customers and head off negative ones! We went from very few reviews from years ago, to regular 5-star reviews in excess of the entire volume of prior reviews, within a few months. ".